Now that financial reform has passed through the Senate, is energy next? As always, that's… unclear. A big problem right now is that no one actually seems to be at the forefront of shepherding the Kerry-Lieberman American Power Act through the chamber. 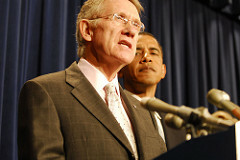 As Darren Samuelsohn reports, Harry Reid was supposed to take charge of the process, but he's still trying to figure out whether to move ahead with a big climate bill or a smaller "energy-only" bill (which, in its current form, is basically a grab bag of subsidies that wouldn't actually accomplish all that much). Reid is waiting to see how a couple different things unfold. First, he wants the White House to get actively involved—the way Obama helped salvage a deal at Copenhagen or stepped in during the intra-party skirmishes over the Waxman-Markey climate bill in the House. But so far, the administration has stayed aloof. (That's not too mysterious: According to Eric Pooley's excellent book The Climate War, Rahm Emanuel was extremely skeptical of having the House pass a climate bill, deeming it a political loser.) True, a few officials here and there have tried to make the link between the Gulf spill and energy reform, but the president certainly hasn't been pounding on that connection publicly, and he's done little more than voice perfunctory support for the climate bill. "The silence from the White House is deafening," said a former Clinton-era White House aide. "Clearly without a White House push there does not seem to be adequate political momentum." Since leaving the Kerry-Lieberman talks, Graham has added to his list of demands for what needs to happen before he returns to the bargaining table. Now, Graham says he also wants a resolution to the uncertainty surrounding the month-old Gulf of Mexico oil spill. Graham also said he could vote for a Senate energy and climate bill, but he must see offshore drilling provisions he originally negotiated with Kerry and Lieberman added back into the bill. At issue is language stripped out at the behest of Sen. Bill Nelson (D-Fla.) that would maintain a 2006 law to keep rigs 125 to 235 miles off Florida's Gulf coast. It's quite unclear what sort of clarity Graham needs before he's willing to work on an energy bill, but this is vague enough that he's essentially giving himself an all-purpose out—after all, this Gulf Coast mess is going to linger on indefinitely. And his second new demand looks like a deal-breaker. Opening up Florida's coast for further drilling would undoubtedly cause Florida's Bill Nelson to filibuster the bill. So unless Graham can haul in a slew of additional supporters for a climate bill (and he hasn't been able to so far), you'd just be swapping Graham's vote for Nelson's and getting nowhere. Are there any other potential Republicans backers? Samuelsohn quotes Georgia's Johnny Isakson as saying he's intrigued by the fact that the Kerry-Lieberman bill would lead to a huge expansion of nuclear power (at least according to the Peterson Institute study I discussed yesterday). Isakson claims he'll keep an open mind until he reads the bill. But how likely is that? And, meanwhile, Kerry and Lieberman are reaching out to Olympia Snowe, Scott Brown, Judd Gregg, and Florida's George Lemieux, but nothing's come of those talks yet, either. So, yes, there's still a slim chance that a big climate bill can pass this year. But something needs to change. Maybe the White House decides to make a full-court press. Maybe some of those Republicans who always claim to care about global warming (Snowe, Collins, Gregg) decide they actually want to do something meaningful about it. Or maybe after the EPA models the bill—and that will be done sometime in mid-June—the results will be so eye-catching that senators take a second look. But until there's some dramatic outside shock, the bill's stuck in neutral.